The race season is virtually upon us, folks. The live racing coverage this year starts with Monster Energy Supercross, which heads out to Anaheim, California this weekend for its season opener. 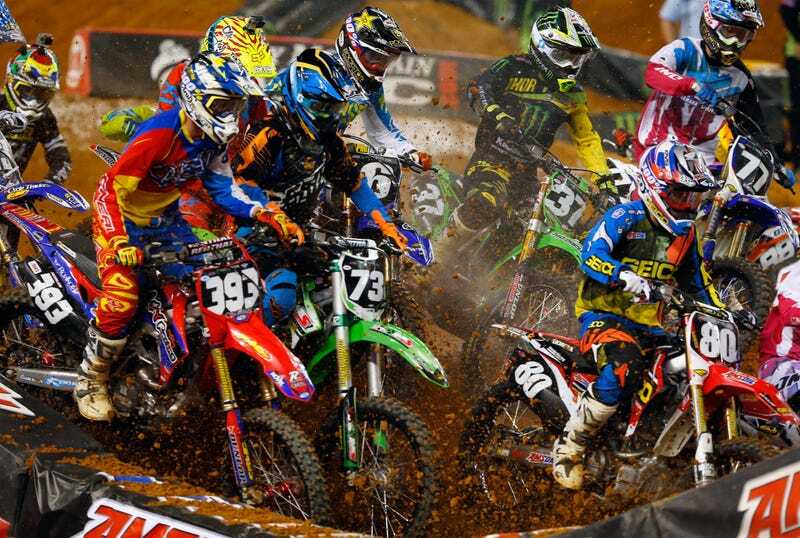 Opening weekend for Supercross tends to be a breath of fresh air (read: a return of normalcy and live television coverage of racing), and there are plenty of showings throughout the weekend. But Supercross isn’t the only live event. The Dakar Rally is well underway, and it had a rough start this year—a car went off course before the rally officially began, injuring 11 spectators. The live timing feed can be found here, and rally highlights will be on television throughout Saturday and Sunday. Other than those events, everything else is, sadly, on delay. But there’s plenty of repeat racing to go around, including the Lucas Oil Off-Road Racing Series, American Sprint Car Series, Lucas Oil Modified Series, Monster Jam, FIA World Rally Championship, Lucas Oil Late Model Dirt Series and Red Bull X-Fighters. Just think—we’re one weekend closer to the openers for those series, too. If you’re having a kickoff party (or three) for the upcoming racing season, I’ll bring the chips and queso. And, as always, feel free to share anything else you know of that’s going on this weekend in the comments below.